Soumbatimi sorghum panicle (photo credit: Jonathan Odhong/IITA). In southern Mali, crop residues of sorghum and millet are a key animal feed resource for many of the small crop-livestock farmers. Together, the two crops are the main dryland cereals produced in Mali. For most of the country’s predominantly rural population, both crops are a staple food and a ready source of cash. 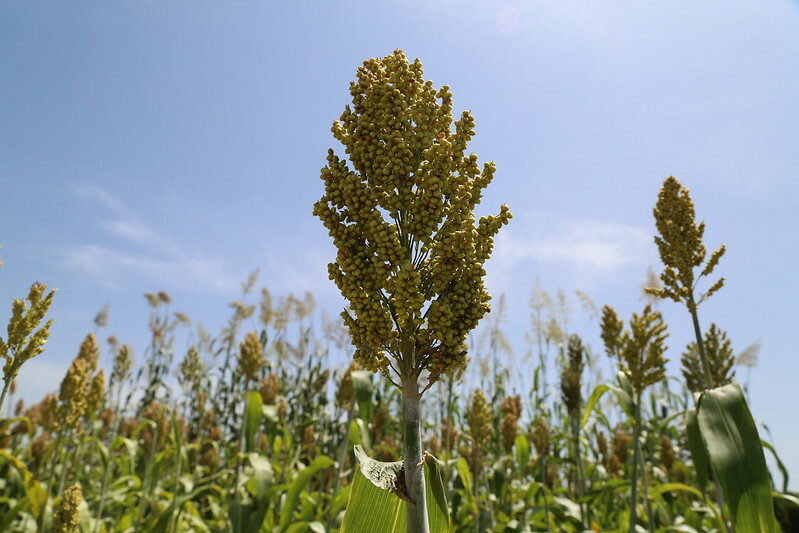 But over the years, thanks to low soil fertility and erratic rainfall (exacerbated by climate change), the productivity of both crops, particularly sorghum, has stagnated despite an ever increasing demand. Over the past two years, the Africa Research in Sustainable Intensification for the Next Generation (Africa RISING) program has been working with various partners in southern Mali to introduce high yielding, farmer (and livestock) preferred dual-purpose sorghum varieties. The intervention builds upon activities by other projects such as the Dual-purpose Sorghum and Cowpea Project and the Seed Systems III Projects (funded by the McKnight Foundation) and the Africa RISING large-scale diffusion of technologies for sorghum and millet systems (ARDT_SMS) project. Through the intervention, the sorghum varieties being validated and disseminated to farmers are not only for food and nutrition security, but will also guarantee availability of quality feed for livestock from the stover. ‘We have worked with farmers from various communes in Bougouni and Koutiala districts over the last two years to validate the yield advantages of three improved dual-purpose sorghum varieties and compared these to local varieties. We have also evaluated the fodder yield and fodder quality of these varieties under different agronomic practices such as when a farmer applies chemical or organic fertilizer and the results are impressive–both from the data we’ve gathered and the feedback we get from farmers,’ explains ICRISAT sorghum breeder and Africa RISING dual-purpose sorghum activity leader, Baloua Nebie. Higher yield: The dual-purpose sorghum varieties provide better grain yield compared to the local landraces making them a sure bet for farmers to achieve food security. 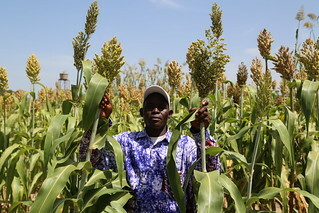 From the first-year evaluation of the varieties at the Africa RISING technology parks in Madina Commune (Bougouni District), the grain yield advantages of the most preferred dual-purpose sorghum Soumbatimi and Tiandougoucoura were 29% and 72% higher compared to the local varieties commonly grown by farmers in the district. Soumbatimi registered the highest yield with an average of 4.4 t/ha yield while the local variety yielded 2.5 t/ha. Better feed quality and quantity: Whilst farmers have in the past used crop residues of the local sorghum landraces as fodder for their livestock, farmers feedback after the first year of testing dual-purpose sorghum have shown that the three varieties offer significantly better feed quality and quantity. This is is because, unlike the local varieties, dual-purpose sorghum varieties stay green until physiological maturity. Additionally, they also have lower lignin content which makes their stems softer and more palatable and digestible for livestock. Out of the three dual-purpose sorghum varieties, Soumbatimi has emerged as an early farmer’s favourite for various reasons. During a participatory variety selection exercise, farmers expressed that this variety whose name translates to ‘the sweetness of the stem’ in the local Bambara dialect provides the highest yield, is the best for preparing different family dishes, and its stover is more preferred by their livestock. Fousseini Samake (photo credit: Jonathan Odhong/IITA). 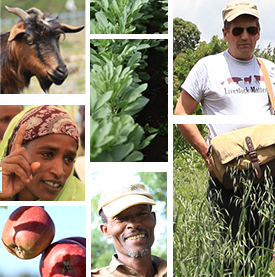 ‘The grains of Soumbatimi are bigger than the local varieties and the cattle seem to enjoy the stover much more than the local variety. It also gives me a better yield than the local variety. For example, I am guaranteed to harvest 8 bags of 100 kg weight if I cultivate a quarter hectare of Soumbatimi compared to only 5 bags if I grow the local variety over the same area,’ explains Fousseini Samake from Flola Village in Bougouni District. ‘Even if you tell women to choose between Soumbatimi and the local varieties, they will choose it [Soumbatimi] because it’s really good for making our local meals like tô [thick porridge]. I really like the cleaner look of Soumbatimi when its grain is used to make a meal compared to the local varieties,’ he adds. In October 2017, Aminata Tangara, the country director of the Mali Agricultural Market Development Trust (MALIMARK) accompanied the National Director of Agriculture on a visit to the Africa RISING technology park in Koutiala. While touring the park, she was impressed by the different improved agricultural technologies that were being demonstrated. One of them – the Soumbatimi sorghum variety demonstration, caught her attention most. With a greener thicker trunk, more grains on its panicle and its dual-purpose nature, the variety ticked all the right boxes for an outgrower program managed by MALIMARK Trust. Tangara immediately made up her mind to acquire Soumbatimi seeds and include them among the crop varieties to be planted by MALIMARK Trust outgrower farmers. ‘I was already collaborating with the ARDT_SMSProject, so through this partnership I acquired 300 kg of Soumbatimi foundation seed and distributed 5 kg each to 60 of our outgrower farmers. They will cultivate it and produce certified seed which we will buy back from them, package and sell because this is a very promising variety, ‘ said Tangara. Given sorghum’s central role in the agricultural economy of Mali, Africa RISING is increasing sorghum productivity which has been a major policy goal of the government since the Sahelian droughts of the 1970s–1980s. 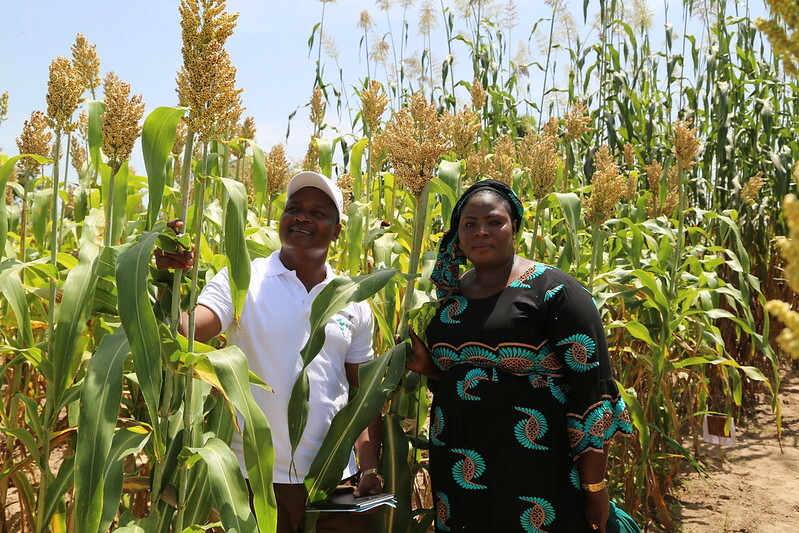 Dual-purpose sorghum varieties are now available and are expected to significantly contribute toward ensuring that the current and next generation of Malians are food secure and their livestock are well nourished too. Baloua Nebie and Aminata Coulibaly Tangara of MALIMARK Trust (photo credit: Jonathan Odhong/IITA). Tags: Sorghum. Bookmark the permalink.